Well we turned on champion vs champion fights real quick, huh? Henry Cejudo vs TJ Dillashaw takes place this weekend in Brooklyn, New York in the Barclays Centre. Henry Cejudo puts his hard earned flyweight championship on the line as current bantamweight champion TJ Dillashaw moves down to 125 lbs seeking his second belt. Two or three years ago this would have excited the masses. What changed? The UFC was founded in 1993 and up until 2009 there was not a single champion vs champion fight, discounting interim titles (and they should be discounted). Dana White, a sweet science man himself, sought to iron out many of the issues plaguing boxing, hence the whole weight class thing – a different story for a different time. In boxing champions fight champions on a regular basis. Frankly it is difficult to keep up with alphabet belts and constant weight class hopping. As a relatively casual fan of boxing I must admit I have no idea what belts GGG and Canelo had upon their pair of meetings. I only know they were great fights. The concerns of clogging up divisions and confusing matters appear to be the root cause of the hesitation, but in 2009 a superfight between top stars and the current welterweight champion Georges St-Pierre and lightweight champion BJ Penn was too tempting for the organisation. To add fuel to the fire, GSP and Penn had fought in 2006 with St-Pierre being awarded the controversial split decision victory. So they had their first “super fight” and it was an excellent contest, with the bigger man GSP coming out on top with a fourth round corner stoppage. Then things went back to normal after that, and every division had their champions. Then, WME bought the UFC. The importance of Conor McGregor in the current state of things can’t be understated. Before signing with worldwide leader of MMA in 2013, the “Notorious One” had become a double champion – featherweight and lightweight- in the UK based promotion Cage Warriors. He had designs on repeating this across the pond. Upon the acquisition of the promotion by WME in 2016, Conor McGregor was their ubiquitous top star. The biggest story of that year, at least as far as mainstream exposure, was Conor’s fated capturing of a second championship at UFC 205. In doing so he became the first person to hold two UFC titles concurrently. Naturally, PPV numbers for McGregor were huge that year, and UFC 205 set a new gate record at $17,700,000. A lot has been made of the UFC’s new direction after the sale, but it is impossible to deny the emphasis on spectacle. 2016 was a huge year for the promotion, and an interesting year for a new owner to get onboard. Thanks to McGregor’s exploits serving as a blueprint for WME, it’s easy to see why things went in the direction they did. From 1993 to 2015 the UFC staged one champion vs champion fight. Between 2016 and 2019 they have staged three, with Henry Cejudo vs TJ Dillashaw being the fourth. The most recent came in the form of Cris Cyborg vs Amanda Nunes, with bantamweight champion Nunes coming out on top. It was extremely exciting to see Cyborg conquered by a smaller opponent, and the moment will stand as one of the favourites of many (this writer included) in the sports history. But just the other day Nunes announced on twitter she had zero plans to fight at 145 again, she just wanted a second belt. To be fair to the “lioness”, she was brutally honest and wasted little time in announcing this. But one can see quite clearly from this how having one person sat atop two divisions an become messy. Unless the UFC can come at Nunes with some numbers to her liking, she will likely be stripped, just like the previous two champ champs. McGregor was stripped of his featherweight title soon after his victory over Eddie Alvarez for the lightweight title, then he was stripped of the lightweight title but that’s a whole other thing. Current heavyweight champion Daniel Cormier, despite assertions that he would return to the division where he first tasted UFC gold, vacated the light heavyweight belt before the UFC could strip him and give it to Jon Jones. Essentially, this was a “you can’t fire me, I quit” type deal. Now we sit on the precipice of our most recent “superfight”. Regardless of the confusion surrounding it, Henry Cejudo vs TJ Dillashaw is a great fight. When it comes to big fights, questions are what really sells these fights. Is Cejudo truly a different fighter these now? Is TJ truly a better “MMA wrestler” than an olympic gold medalist? How much has the weight cut effected Dillashaw? He says he feels great, but he looks like Christian Bale in The Machinist (2004). Henry Cejudo vs TJ Dillashaw however, actually seems bogged down by being a champ vs champ fight in the eyes of fans. A lot of the talk seems to be directed at the perceived over saturation of these super fights, how they have lost any meaning. In all fairness, fans are fickle, and when this started to happen – as it always seemed destined to – I would have been surprised at any other reaction. The real trouble comes with the flyweight division itself though. 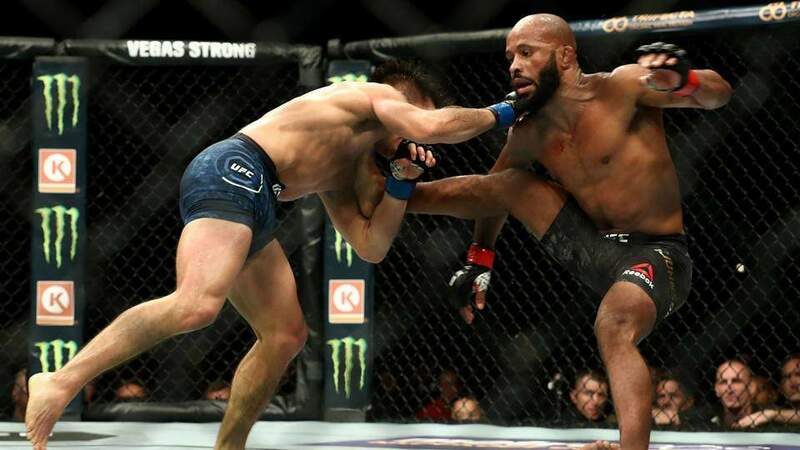 Seemingly on the chopping block since longtime champion Demetrious Johnson exited the organisation, after letting several 125er go it seems as if this fight is for the division’s future. With a Dillashaw win it is difficult to imagine him fighting at this weight again considering the complex process of his weight cut. Dillashaw’s claims notwithstanding, he looks like a ghoul from Fallout. What’s more, TJ has stated he doesn’t care what happens to the flyweight division, something Cejudo has taken issue with. According to an admittedly melodramatic Henry Cejudo, he is going into this fight with the entire division on his back. “The flyweight division will be resurrected” he told the media at Thursday’s press conference whilst wearing a gold snakeskin jacket seemingly two sizes too big for him. He then proceeded to remove a rubber snake from a bag and beat it against the stage as Dana White looked on, tired. Also Henry was wearing his Olympic gold medal. Anyway, the fight seems to be coming at expense of the division and of super fights as a whole. Dillashaw has far from cleared out his division, with contenders like Marlon Moraes, John Lineker and a trilogy bout with Raphael Assuncao looming. Cejudo didn’t have a lot to do with the departure of DJ to be honest, so this fight makes the most sense for him. Despite his criticisms of TJ for his mercenary indifference to the plight of the flyweights, he has also proposed going up to fight for the bantamweight title of he beats Dillashaw. It’s a messy situation, but Dillashaw really doesn’t seem to care. He’s doing this for himself, to become the greatest of all time, while it may seem cold, especially considering he has counted flyweights as teammates, that is the mindset of a true competitor. Why should he care? Ultimately the only people benefiting from an increased presence of division jumping are the victors. A win for Dillashaw surely spells doom for the 125 lb division, but how can one blame him? He is merely following his programming, and playing the game as its rules allow. We saw this in 2017 when GSP came back and beat Bisping for the middleweight title only to relinquish it mere weeks later. It was chaos for everyone in the top 10. But that’s the system and people will game it. Don’t hate the player folks, hate the game. Images courtesy of cbssports.com, mmajunkie.com, sherdog.com, mmanews.com and sportingnews.com.